Finding toys for 3 month old children can be tricky as there’s so much to consider. Do you want a toy that develops their motor skills and coordination, or encourages them to think in more creative ways and be social with other babies? If so, you’ll be glad to hear that we’ve researched and reviewed what the best 3 month old baby toys have to offer. All you need to do is have a read through the choices below and pick the one that stands out to you as being the best. You can also utilize our buyers guide section to gain more details about the popular kinds of baby toys available, as well as how to go about selecting the right one for your baby. 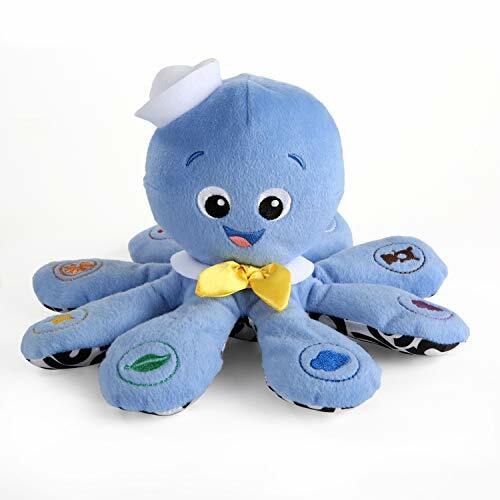 Babies have been having a ton of fun playing with this octopus toy because it has been made with incredibly soft plush materials. Therefore, your little one can cuddle up to it and feel how soft it is. This is fantastic for improving their tactile abilities. Moreover, the hands-on approach of playing is great for helping your baby to develop their hand-eye coordination and motor skills. In addition to this it has been designed with bright colors that make it more exciting to play with. Not to mention, babies can squeeze the toy’s head and listen to the music it play. This is another fun feature that improves their auditory learning senses. 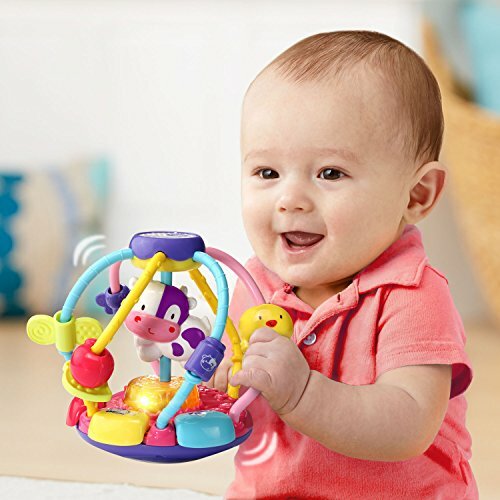 Babies feel encouraged to play with this toy because of how soft it is and how much fun they have listening to the music while improving their auditory learning senses. We were impressed with how this water mat has been made with high-quality PVC materials as it ensures that it’s resistant to leaking. Babies are able to have an absolute blast playing on this mat for hours too. This is because it allows them to be remarkably active by playing and moving around on the mat. As a result, you can expect your little one’s motor skills, hand-eye coordination, and balance to improve. Not to mention, it’s a fun mat to play on with other babies. This can be a great chance for your little one to start improving their social skills early on. They’ve also used bright colors to design the mat, which makes it more fun and helps with your baby’s color recognition abilities. Babies have an absolute blast playing on this mat and being able to be active along with other babies. It’s excellent for their motor skills, coordination and social abilities. We liked how this ball toy has been made with a number of different materials. This is because it provides your baby with a good opportunity to feel different textures and improve their tactile abilities. Furthermore, this hands-on approach to playing is awesome for kids. The size of the ball and the bumps available on it enable babies to hold onto it easily. Therefore, their motor skills and hand-eye coordination are able to develop well. In addition to this, while kids are moving the ball around and playing, they’re able to listen to the rattle sounds that it produces. 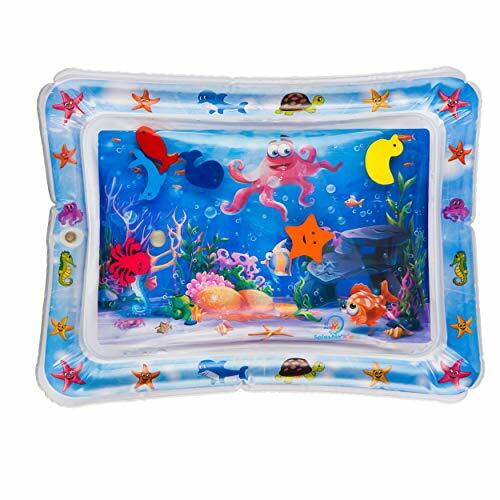 This makes for a more immersive playing experience that improves your child’s auditory learning senses. This is a great toy that helps babies to develop their motor skills, coordination, and tactile abilities all in one! If you have been looking for a toy that your baby can use to keep themselves entertained with while improving their audible learning senses, this Manhattan Toy Winkel Rattle would be a good choice. This is because it allows kids to easily hold the rattle to shake it around and develop their motor skills and hand-eye coordination during the process. They can also improve their auditory learning senses due to the rattle sound that it makes. Parents have also been surprised to find that this rattle can also be used as a teething toy. So, it comes with 2 uses in 1 that enable kids to teeth and play. The plastic materials are free from toxins to ensure that it’s safe for babies to teeth on. We liked how this rattle can also be used as a teething toy as it provides kids with plenty to keep themselves occupied with for a while. 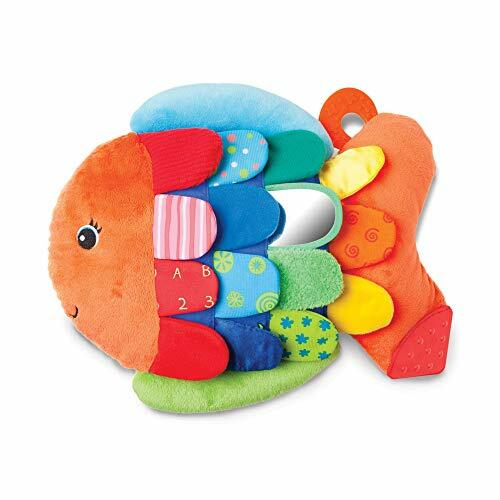 Melissa & Doug’s Flip Fish Toy is a lot of fun for babies to play with due to how much there is on offer. It has been made with bright colors and come with incredibly exciting facial features. This makes it super exciting for babies to play with and improves their color recognition abilities. In addition to this, kids are provided with a hands-on playing experience which develops their hand-eye coordination and motor skills. We also liked how there’s a tail that can be pressed to listen to a squeaking sound. This is incredibly interactive for babies and improves their auditory learning senses. Lastly, the crinkly design enables kids to feel different textures and work on their tactile skills. 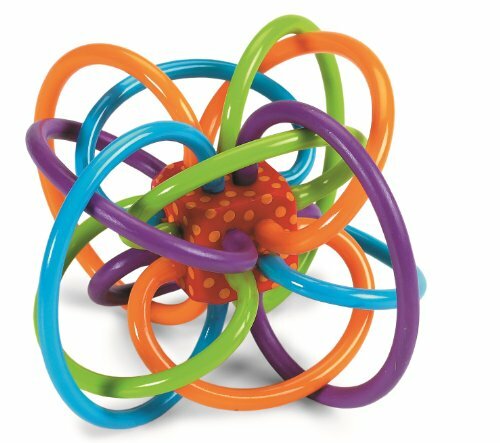 With the colorful design, babies feel encouraged to explore this toy and improve their tactile abilities and auditory learning skills in the process. Are you looking for an educational toy for your baby girl or boy? If so, this Word Book would be an excellent choice. We liked how they’ve made it with fantastic images and a range of bright colors. This makes it a lot more exciting for kids to keep them engaged for longer. While going through the book, children are provided with a great chance to learn about shapes, colors, and animals. Furthermore, we were impressed with how they have implemented different fabrics on the various pages. This enables babies to feel the different textures so that they can develop their tactile abilities. This is a great little book that introduces babies to shapes, animals, and colors, while having fun due to the bright colors. This Skip Hop Rattle Toy has been made with a design specifically for babies. This is because it is incredibly comfortable to hold which lets your little one play with it for a long time. As a result, children are provided with an excellent opportunity to develop their motor skills and hand-eye coordination. While holding the toy and moving it around, babies are able to listen to the rattling sound it makes. This is an excellent way to improve their auditory learning senses in a fun way. Parents have also been pleased to find that there are some rubber materials available that let kids use it as a teething toy too. Your baby is able to use this rattle to improve their auditory learning senses, while also teething on it and being able to develop their coordination and motor skills. 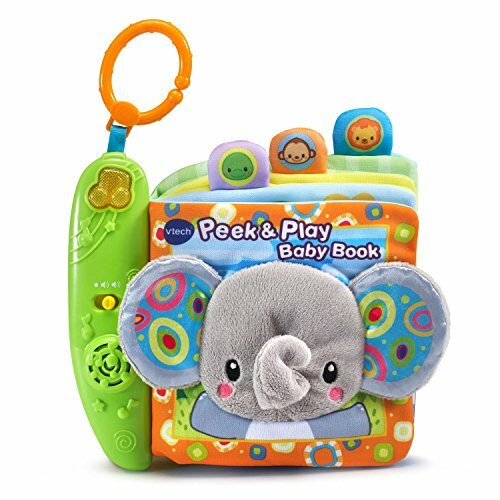 Vtech’s Peek & Play Book Toy is another fantastic option that allows kids to learn more while also having a lot of fun. We liked how there are 6 soft pages available for kids to flip through and learn about different animals. In addition to this, there are various fabrics available on the book that allow kids to feel different textures. These are effective for improving your little one’s tactile abilities, as well as their motor skills. We also liked how there is a range of over 50 songs that can be played as well. This allows babies to have a more interactive and fun learning experience, while improving their auditory learning senses. 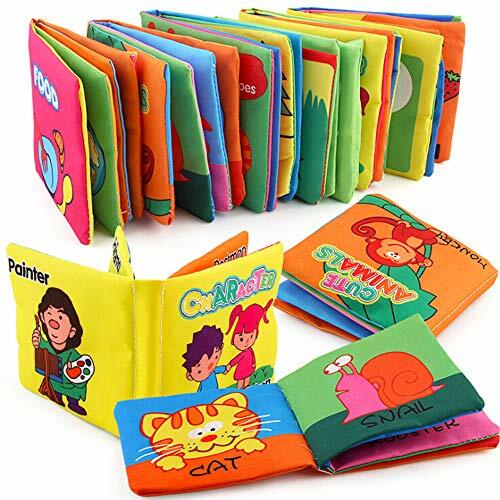 Babies have a lot of fun being introduced to different animals, numbers, and colors while using this book toy due to how fun and interactive it is. Babies have been having a blast playing with this caterpillar toy as it comes with a range of songs. These are super fun for babies to listen to while playing and it improves their auditory learning senses. Furthermore, we liked how they have used various materials to make this toy. It provides kids with a great chance to work on their tactile abilities by feeling different textures. Moreover, they’ve used tons of bright colors with this one. As a result, babies are more excited to play with the toy and they’re able to improve their color recognition abilities. It also involves a very hands-on playing experience, which is awesome for your little one’s motor skills and hand-eye coordination. 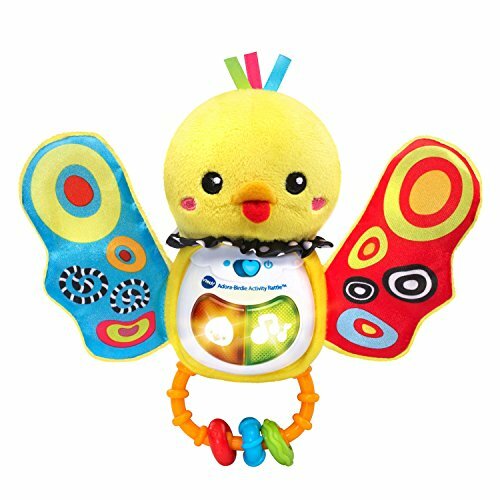 Babies have been having fun keeping themselves entertained with this caterpillar toy due to its bright design and songs. Their motor skills, coordination, and auditory learning skills are able to improve greatly. This ball toy by VTech has been made with a range of tracks that feature little beads. These allow your little boy or girl to move the beads around in different ways by shaking, sliding, and twisting them. As a result, you can expect their hand-eye coordination and motor skills to improve greatly. Furthermore, there are motion sensors built-in that detect your child’s movements and react by playing music. This is incredibly interactive and helps your baby’s auditory learning skills to improve. There is also a range of buttons available that help kids to learn about words, numbers, animals, and colors. We were impressed with how the motion sensors can activate music while allowing kids to learn about colors, animals, and words by pressing the buttons that are included. 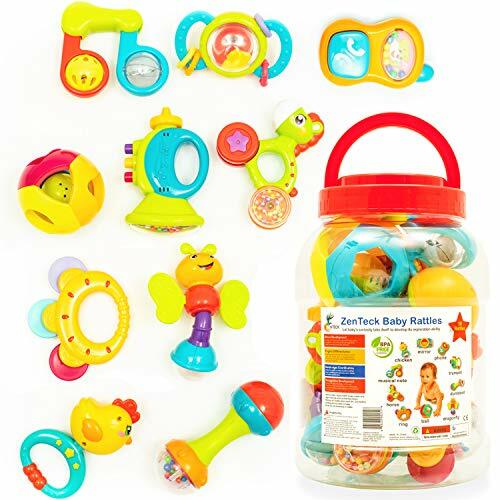 VTech’s Baby Rattle features a total of more than 30 songs and phrases. 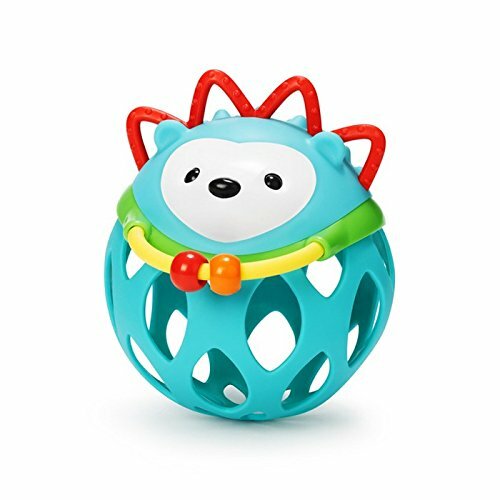 These allow your little one to listen to different songs and sounds to have a blast while improving their auditory learning sense. We also liked how children can hold this rattle toy to move it around and listen to the rattle sound that it makes. They have designed the handle to be very easy for babies to hold onto comfortably. As a result, your child’s motor skills and hand-eye coordination are able to improve. In addition to this, the toy has a range of different materials which lets kids feel various textures and improve their tactile abilities. This is a fantastic rattle toy that lets kids improve their auditory learning senses, while having a lot of fun with the different textures and working on their tactile abilities. This rattle toy set comes with a total of 9 rattles and teething toys. Therefore, you can be sure that your baby girl or boy is provided with plenty of options to play with and keep themselves occupied for a long time. We were impressed with how they’ve used high-quality ABS plastic materials to construct these toys. This is because they are incredibly durable and free from toxins which makes them safe for your little one. While kids are holding onto these toys, they’re provided with an excellent chance to develop their hand-eye coordination and motor skills. Listening to the rattle sounds they make is also great for their auditory learning senses. 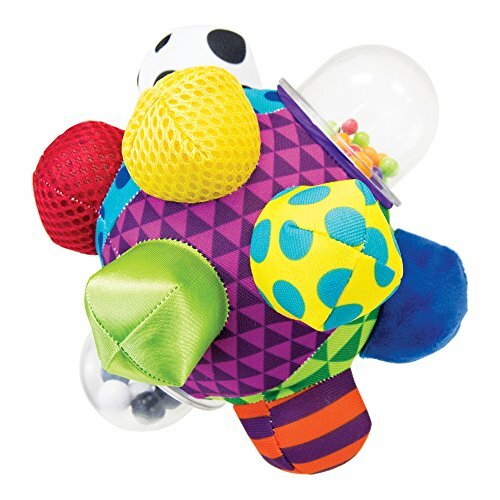 With 9 rattle toys, that can also be used as teething toys, babies have plenty to play with for a while. Their auditory learning senses, motor skills, and coordination are able to develop while playing with the set. We liked how this rattle toy set has been made with super bright colors as it makes it more exciting for babies to play with. It can also be an effective way to improve your little one’s color recognition skills. In addition to this, children are able to grasp onto these toys to play around with them in different ways. Therefore, you can expect their motor skills and hand-eye coordination to develop well. This is especially because they have designed the toys to be lightweight and the perfect size for smaller hands to hold onto. We also liked how these rattle toys can improve your child’s auditory learning senses due to the sounds it makes. This is an awesome set that lets kids develop their coordination and motor skills, while having fun rattling the toys and listening to the sounds they make. Babies have been having a ton of fun with this VTech Moosical Beads set. This is largely because it has been designed with a range of awesome buttons that can light-up and make for an immersive playing experience. These light-up buttons are great for your baby’s visual learning senses. Babies can also press these buttons to learn more about shapes, numbers, letters, and colors. Pressing these buttons is excellent for their motor skills and hand-eye coordination. Not to mention, the cow toy has been made with remarkably soft plush materials. The fabrics on the outside also let kids feel different fabrics so that they can improve their tactile abilities. We were impressed with how this toy manages to combine learning and play to provide your 3 month old baby with plenty to be engaged with for a while. Now that you’ve had a chance to read through what the top 3 month old baby toys have to offer, you can start to narrow down your search until you find the one that sticks out to you the most. However, if you’re having a hard time with picking, don’t worry. We’ve created this buyers guide section to help you out. You can use it to gain more information that can prove useful when finding the best 3 month baby toys. At 3 months old, you will find that most boys and girls are pretty happy to play with the same kinds of toys. However, there are certain toys that are better for girls as well as options that are better for boys too. To learn a little more about these differences, take a quick look below. When it comes to toys for three month old boys, you may want to focus on the ones that have been made with blue and red colors. This is because these are the kinds of colors that baby boys seem to respond well to. As a result, they will feel encouraged to play with the toy more often and be able to benefit from the developmental features that they have to offer. As far as toys for 3 month old girls are concerned, we recommend that you go with ones that have been designed with pink and purple colors. Little girls tend to be more excited when toys have been made with these colors which makes them more fun to play with for longer. 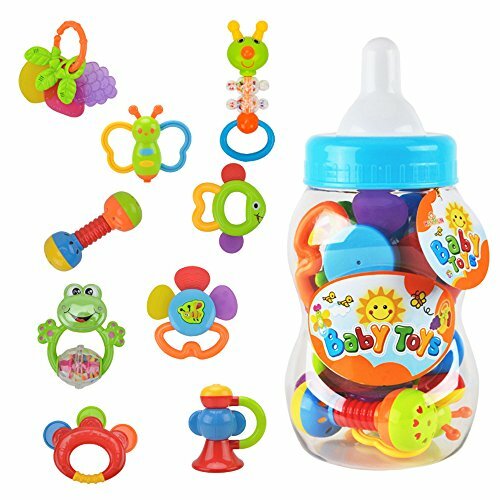 After reading through our review of baby toys 3 months, you will have seen that there are a number of different kinds available. If you wanted to gain a better idea of the different types so that you can easily distinguish between them all, take a look at the section below. 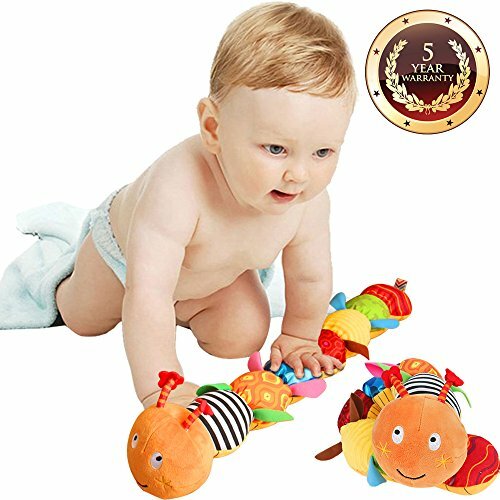 The most popular kind of toy for 3 month old children includes developmental ones. This is because babies are experiencing a lot of different things as they grow older and their brains are able to soak up information like a sponge. Therefore, it’s important to find them toys that help them to progress with their developments. Your baby’s motor skills and hand-eye coordination are among some of the developments that can be improved greatly by playing with the right toys. That’s why we’ve made sure to include plenty of toys in our review that involve a hands-on approach. This enables babies to hold toys and press different things to work on their motor skills and coordination. There are also awesome toys that have been made with different fabrics to let babies feel various textures and work on their tactile abilities. 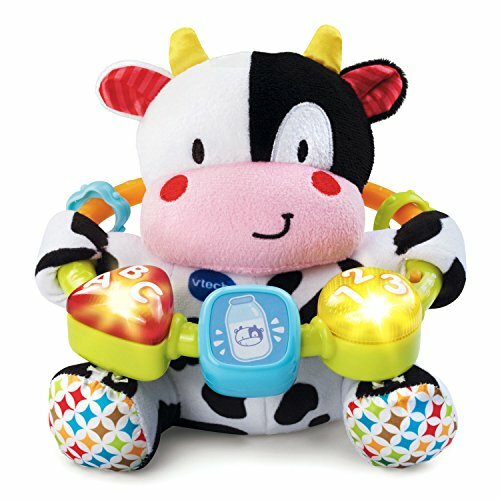 In addition to this, many of the most popular toys for 3 month old babies have been made with music and light features. This is because it keeps kids engaged in the activity for longer because of how exciting they find it. The music and light effects are also incredibly effective for improving your little one’s auditory and visual learning senses from an early age. Educating babies on different topics doesn’t need to be as complex as you may be thinking. There are some awesome toys that simply introduce kids to the concept of different numbers, colors, shapes, and animals. This is a great way to help your baby to become more familiar with these topics so that they can be in a better position to strengthen their knowledge on them when they’re older. The toy books that are included in this review are excellent for helping to educate your baby in a fun and stimulating way. At 3 months old, babies are having a blast being able to roll around on the floor and play to keep themselves occupied. However, you can enhance their experience with something like a play mat. The one that we’ve included in our review has been made with a range of bright colors that make it super fun to play with. There’s also room for your little one to play with another baby. Therefore, their social skills are provided with a fantastic chance to improve early on. So, that brings our review of the best 3 month old baby toys for girls and boys to an end. Make sure that you read through the main features, pros, cons, and what makes each toy stand out. That’s what will ensure that you have a well-rounded view of each toy before deciding if it’s the best choice or not for your little one. Also, be sure to use our buyers guide to learn more about the amazing benefits that these toys can have, as well as the popular types available, as well as how to go about picking one for your boy or girl. Hopefully, everything in this post helps you feel great about making a final decision!